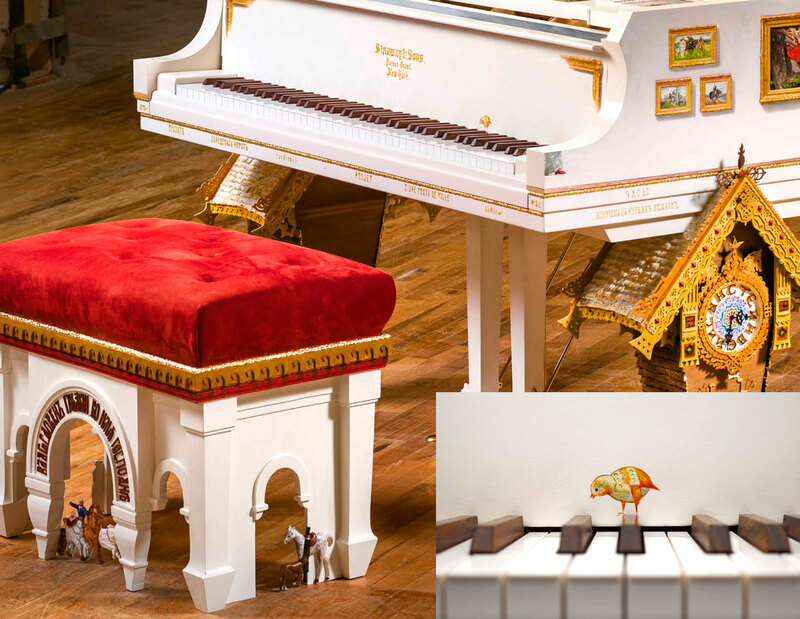 Steinway and Sons, have finally revealed their latest art-case piano entitled “Pictures at an Exhibition”. 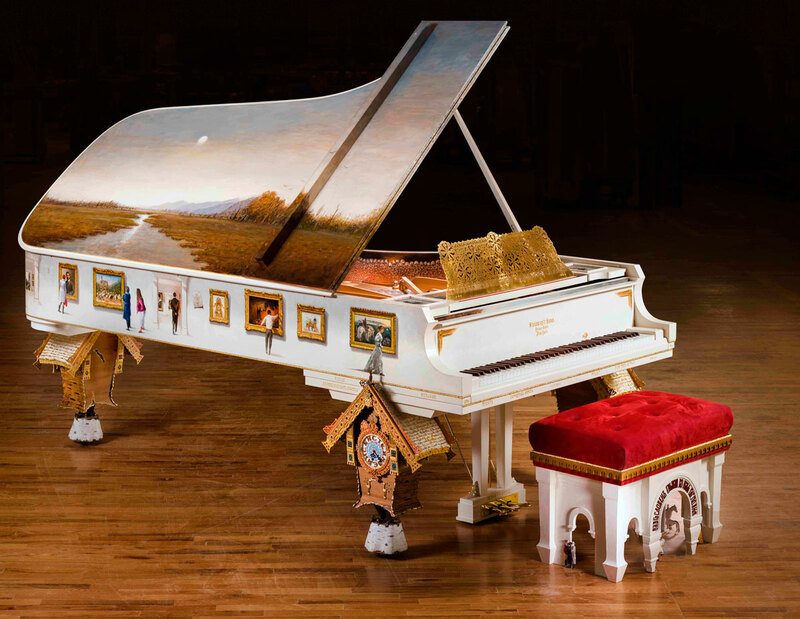 This stunning instrument, based on the Model D grand, was designed, painted, unveiled and played by Steinway master artist Paul Wyse. This piano took four years to complete and is Steinway’s first art-case instrument to be inspired by an actual musical composition. The piano’s white and gold colour palette emphatically reflects the imperial Russian theme. “Pictures at an Exhibition” is Russian composer Modest Mussorgsky’s best known work. It was originally written for the piano in just 20 days (during June 1874). Maurice Ravel famously orchestrated it in 1922. Many artists, both classical and contemporary, have subsequently revisited it. The original composition features ten movements, and is a musical representation of a visit to an art gallery. Each movement is a musical interpretation of a painting by Mussorgsky’s friend Viktor Hartmann. The paintings were actually exhibited by Hartmann in 1873. Unfortunately most of Hartmann’s original paintings are now lost, and where no reference to the original is available, Wyse has fashioned his own interpretation. Some of the movements are linked by a “promenade” symbolising the listener’s progression from one picture to another. 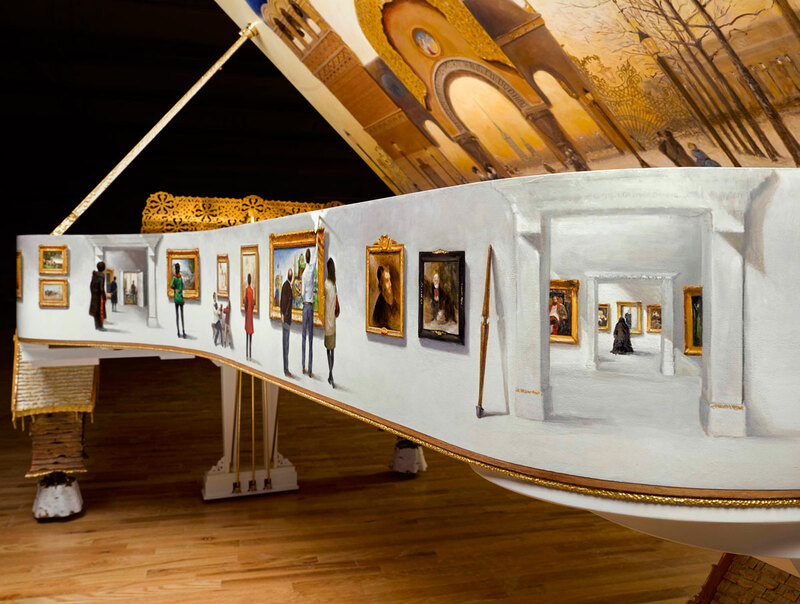 This piano’s case is a modern depiction of a visit to Hartmann’s original exhibition. Like Mussorgsky’s great work, it tells its own story. The rim of the instrument is used as a gallery wall, showing contemporary characters exploring the various paintings. These feature Hartmann’s works along with images and personalities from Russian musical history and folklore. Ravel can be seen in one painting, and works by great Russian artists Viktor Vasnetsov, Ivan Shishkin and Ilya Repin also feature amongst the various “exhibits”. Four doors appear at regular intervals amongst the paintings. These lead to portraits of Mussorgsky’s compatriots… Nikolay Rimsky-Korsakov, Alexandr Borodin, César Cui, and Mily Balakirev, known together as “The Russian Five”. Portraits of Mussorgsky and Hartmann appear in the piano’s gallery, along with a self portrait of Paul Wyse himself. The lid is adorned on both sides with oil paintings. The inside shows the Great Gates of Kiev (the Bogatyr Gates) – the source material for the final movement. The image on the top depicts a landscape, in the style of Shishkin, and represents the remote countryside where Baba Yaga lived. The legs represent Baba Yaga’s hut (another of Hartmann’s paintings). Baba Yaga is a hideous witch from Slavic folklore, and famous for scaring children. The stool is modelled on the lower part of the Bogatyr Gates, and the carved characters also appear, in painted form, on the inner lid. 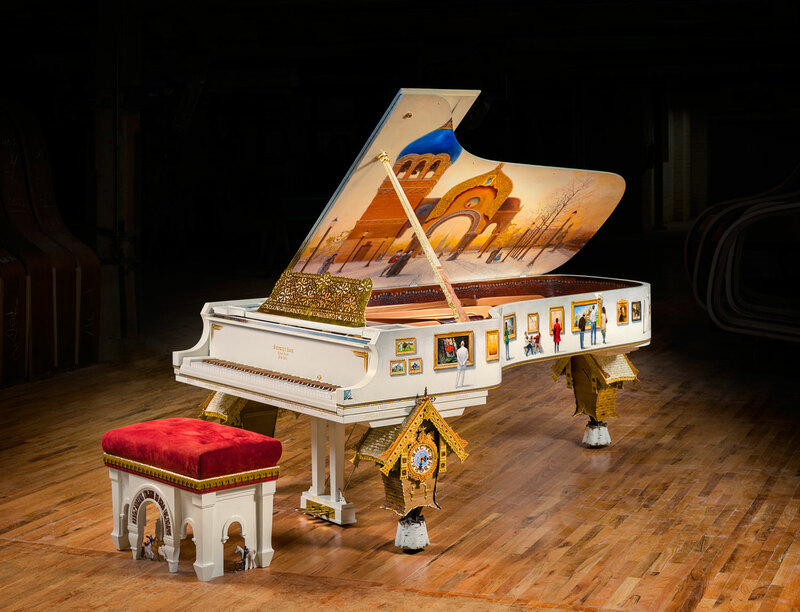 Twenty-four carat gold leaf highlights are expertly worked into the intricately detailed paintings, and the gold-plated music desk and pedals frame the original rose wood keys. 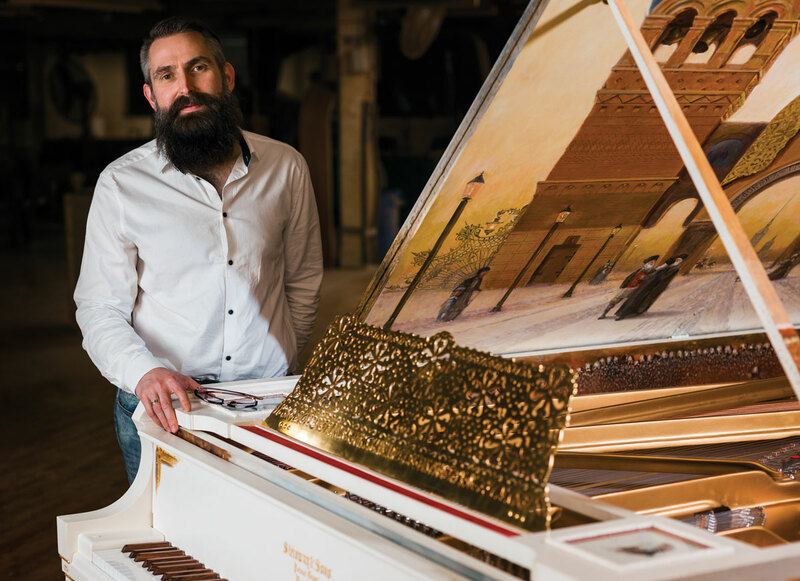 Steinway have a tradition of producing extraordinary art-case pianos, and this instrument further enhances their reputation. The “Pictures at an Exhibition” piano is a one-off, and it is still available to purchase. The price? A mere $2.5million.